Not to be too dramatic about it, but it’s about damn time. Almost every group, organization and/or species has a week or month named in honor of them. Often times it sounds like a joke when you hear some of their names and so too may the impression here now for some, but it’s not. My friend and fellow Voice Over Talent Dave Courvoisier kinda mentioned the idea in passing when he noticed in his blog about a week or so ago how many voice over activities were taking place in the month of September (more than usual, it seemed). For example: Amy Snively’s Faffcon is taking place in Portland, Oregon on September 11 & 12th. Joan Baker’s New York City-based “That’s Voiceover” LINK is taking place on September 22nd. These events in addition to the usual voice over seminar suspects like Pat Fraley’s regional seminar in Buffalo, NY on September 25th & 26th mean that the summer slumber has been shaken off. Then Dave sent me an email Saturday (yes, just this past Saturday) saying this National Voice Over Month idea was gnawing at him and what did I think. I copied him, Amy Snively and Bob Souer on my answer (because I feel it’s always better to cause trouble in a group); my answer was that Dave’s idea for a National Voice Over Month was the right idea and that we could pull it off in four daysâ€¦and now we are. Somewhere in there, Voice Over Xtra!’s John Florian and Voice Talent and Social Media Tour De Force Terry Daniel I believe also got roped into this and I think there are many others who are contributing to this month long event as well. I hope you’ll take time to acknowledge all their efforts when you see them on-line on blogs, podcasts, videos or social media outlets like Twitter or Facebook etc. Dave grabbed a domain and created a web site, Amy drew up a logo, I helped with some copy and we’re all still actively adding to the program â€“ as a professional voice talent you are sincerely encouraged to participate in whatever manner you feel you want toâ€¦maybe comment on blogs, retweet NVOM announcements, or maybe create a Voice Over meetup in your city where all the voice talents get together for a visit. One of the more interesting things to see was how Dave (the true driving force of this idea) called for a hastily called weekend vote on Saturday from the board of SOVOA to endorse and support September as National Voice Over Month; by Sunday it was passed. Brilliantly executed and kudos to the Board for the response time. Our goal, I think, is simple and openly self-servingâ€“ share with as many people as possible what Voice Over Talents do, who they are and where they can be found. Yes, we are trying to create awareness among potential employers for every voice over professional in this industry but I think we’re also trying build on the credibility we’ve established in the wake of our collective professional works this far. I’m proud of my very small part in all this because I believe strongly not only in the art and industry of Voice Over but also in the men, women and children who perform within it around the world. We are a talented bunch and it’s not a bad thing that we say that ever so brieflyâ€¦maybe once a year. Will you celebrate with us? 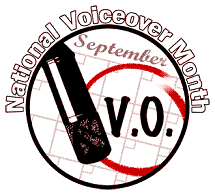 Let me know how you’ll be a part of National Voice Over Month. The logo was Amy’s handy work. I’ll look for your blog post coming soon. What a great idea! Voices of Vision is also in September. 🙂 Congrats to Dave and yourself and Amy and everyone else who participated in getting Voiceover Appreciation Month off the ground! Wow! In the rush to get all the stuff done with Dave, I forgot to mention that to him. Will rectify that RIGHT away. Please also let the organizers of VoV know about NVOM too – we’ll cross promote and we’ll give your team another tool to sell against! Awesome~ Thanks Jodi. Thanks Jodi, I also pinged Dave as well as John Florian and Terry Daniels since they are helping promote NVOM as well. With your permission, I would love to talk about this on our blog and ecm. This month at Voice123, I have had many people approach me about events, and it is uplifting to see the summer end and get back to having some fun! haha! Sure Steven, that would be great, thanks.